If you are looking to further the education and training of your bilingual or staff interpreters, then we’ve got the program for you. Through our interpreter training services, we can set up a program specially designed for your staff. Our training programs include an internationally recognized course on professional interpreting, which is offered several times each year. We also teach providers the best way to utilize interpreters, what to expect of a professional interpreter and key components of cultural competency as they affect your specific industry. Check our events page for upcoming Bridging the Gap programs. 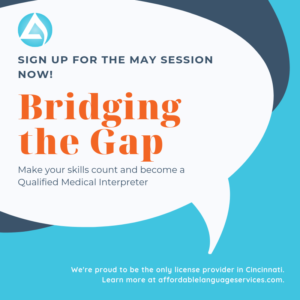 Contact us now for more information on our Bridging the Gap medical interpreter training program.